Wow, a bit of a strange week and some extra Mummy & Thomas days too! On Tuesday, nursery called to say that T had come out in a rash, so I left work early and collected him, I couldn't get him an appointment until Wednesday morning so we had a few snuggles and played. The doctor sent us to the hospital to be monitored for meningitis anyway, we were discharged and I was left to monitor him myself at home. He's actually ok in himself, but I needed to be there with him, so we've had some lovely, unexpected time together. We're pretty sure that the rash is just a virus now btw. 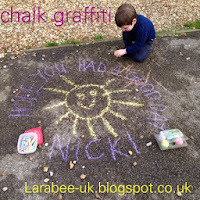 One of the things I wanted to do this autumn was to leave some chalk messages for people, I particularly wanted to leave personal ones rather than general ones for now, so out we went on a lovely sunny day and left some messages. 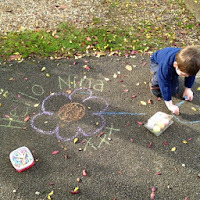 T was really keen to get outdoors, he spends so much time outside at nursery that he does get a bit of cabin fever when kept in for too long, he particularly loved this activity because in his eyes he was doing something he shouldn't be! I can't wait until he can draw the pictures (recognisable ones anyway) and write messages. 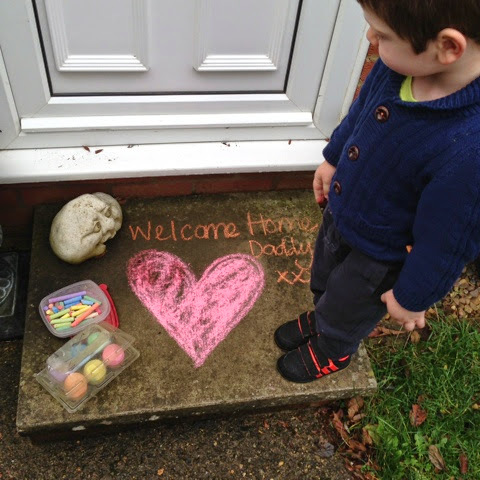 We even left one for Daddy for when he comes home from work. I'm hoping this is just the start! 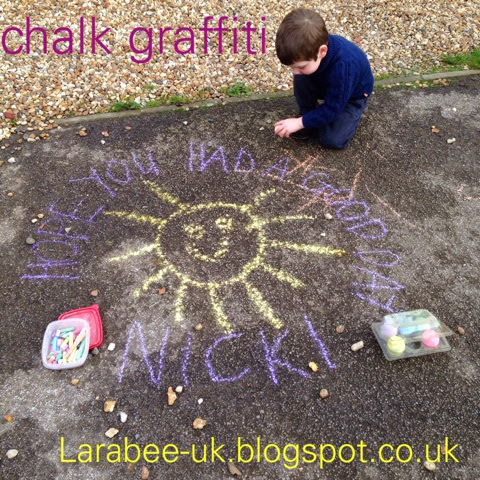 I now plan to leave various messages, especially for the postman and other people who live in the road. i love the idea of leaving little messages for people to brighten up their day , thats really sweet. What a great idea, it's a shame that T was poorly this week but at least you got to spend some quality time together and you did something you've had planned for a while. Thanks for linking up with Country Kids.